We lucked out again with the weather for the Meetup, once again. I *almost* cancelled the fundraiser after waking up to sheets of rain the morning of the Meetup. I figured who's going to want to show up in the pouring rain? I should have known better. There are a lot of diehard members out there! Thankfully, there was very little rain during the Meetup and it even warmed up a little with a clear sky towards the end. So I'd say my record for great weather at Meetups remains largely intact! A very huge thank you to everyone who made a donation to Japanese Earthquake Animal Rescue and Suport (JEARS) at this very special Meetup. There were a few VERY large contributions from some members – you blew me away with your generosity! We raised a total of $1000 for JEARS – much more than I ever expected. Great job everyone!! Thank you Antonio for providing the baked dog treats – Koshi loved the organic veal jerky. There are still a few bags of goodies left over and I'll be sure to bring them to sell at the next Meetup. Another thank you to Dana & William for that amazing sign! It was perfect for the fundraiser. Good thing you put the protective cover over it because it got peed on – several times! Unfortunately due to less than ideal conditions, the planned photo shoot to raise money for JEARS was cancelled. We will try again at the next Meetup which will mostly likely happen in June. I have included a copy of the PayPal receipt below I received for the donation made to JEARS (click image to see full size). The Canadian dollar is so strong right now that our $1000 donation amounted to $1008 in US funds. Gotta love that! I am still awed and amazed by the sheer generosity of everyone. I just can't thank you all enough! I have also included the email I received from David Wybenga, the co-founder of JEARS. Thanks so much – that is amazing! My congratulations and appreciations to yourself and hardworking volunteers and supporters. I know it's been a long time coming but a Shiba Meetup is finally in the works. As this may be one of only a few planned Meetups for this year, I wanted do something really special. Vancouver Shiba will be raising money at this meet for the animals of Japan that have been affected by the devastating earthquake and ensuing tsunami on March 11, 2011. 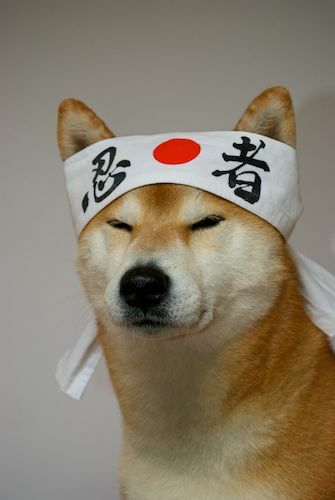 I implore you all to honour our beloved Japanese dogs by making a small donation to help the animals affected by this tragic natural disaster in their native country. 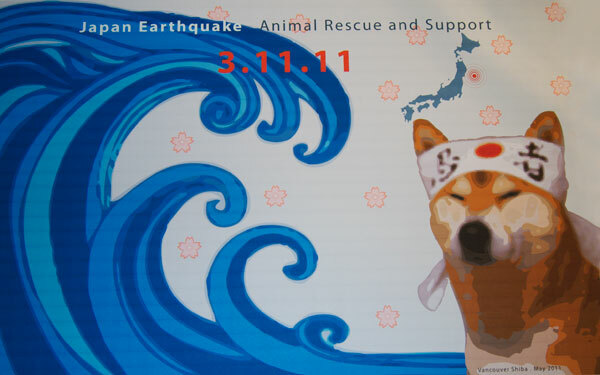 The organization we will be fundraising for is the Japan Earthquake Animal Rescue Support (JEARS). I will be making a batch of my "famous" Liver Brownies and will also have a few bags of duck jerky on hand to sell at the Meetup. There will be a raffle held for a small gift basket. I could use a few more items to be added to the basket (some treats would be great!). If you would like to contribute, please bring something to the Meetup and I'll add it to the basket. There will also be a donation jar available to collect money for JEARS if you do not wish to purchase anything at the Meetup. We're sure you're all aware of the devastation and turmoil following the recent earthquake and tsunami in Japan. The images of ruin and lives turned upside down are prevalent in our minds. What is often overshadowed by the stories of human struggle are the animals who have been affected by the quake and tsunami. Vancouver Parks Board Commissioner and Vancouver Shiba Member, Stuart Mackinnon has asked us to post his notice, appealing to the residents of Vancouver to find something in their hearts and chequebooks for the animals that have been affected by the tsunami. 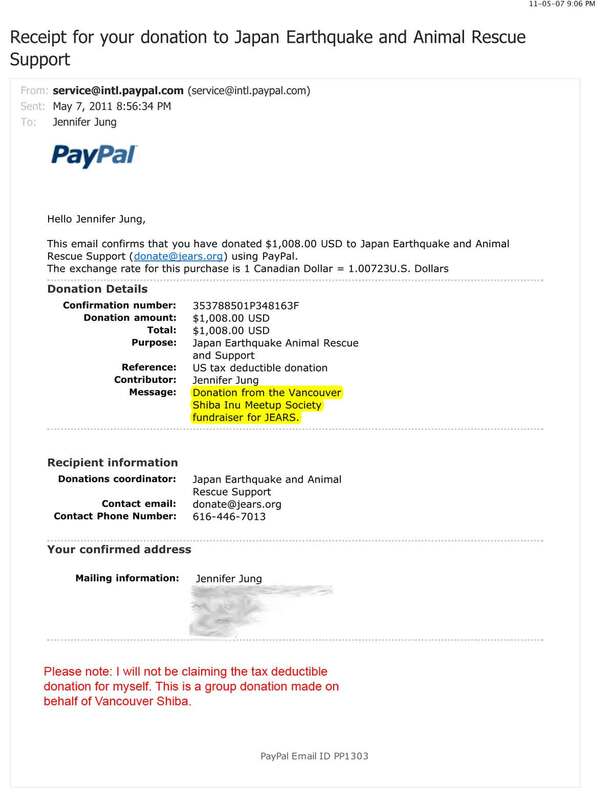 We at Vancouver Shiba encourage our members to donate to the relief effort efforts as well. (Vancouver), Park Board Commissioner Stuart Mackinnon is asking Vancouver residents to remember the animal victims of the Japanese tragedy. “Along with the incredible human suffering and destruction caused by the Earthquake and Tsunami, many animals were swept away and lost. Many that survived are now homeless and need our help”, said Mackinnon. Rescue organizations like Heart Tokushima, Animal Refuge Kansai (ARK), The Japan Cat Network (JCN), Animal Garden Niigata, and the Nippon SPCA are actively rescuing animals from the devastated area. An on-line information group, the Japan-Earthquake-Animal-Rescue-and-Support can also be accessed through Facebook. Mackinnon, Vancouver’s elected Green Party Park Board Commissioner, is urging people to also donate to animal rescue organizations in Japan. “I have donated to not only the Canadian and Japanese Red Cross, but also to an animal rescue organization” said Mackinnon. “Animal Rescue Kansai (ARK) and the Japan-Earthquake-Animal-Rescue-and-Support have Paypal accounts so you can donate on-line”, he added.